And learning to do it well can make all the difference for a man. Let’s compare it to something we’re more likely to notice. We’ve all had that moment where, after turning through several pages of a novel, we suddenly realize we haven’t the faintest idea of what we just supposedly read. We saw the words on the pages, but we didn’t actually take the time to process them mentally. In other words, there is a difference between seeing and reading. Seeing happens as long as your eyes are open. It is a passive biological process. But reading requires you to exert some brainpower. It is an active process of making meaning. When it comes to listening, we have a tendency to look at the words but never really “read” what our family, friends, and co-workers are saying. But poor listening habits can be overcome. As we press on towards becoming better men, the stereotype of the tuned-out male does not need to apply to us. In this first installment of a three-part series, we’ll look at the overlooked emphasis of listening within our daily interactions, the three available levels of listening, and the benefits that are to be had by developing this skill at its highest level. You might be surprised how much we are required to listen in the course of an average day. Yet, unlike many of the other essential skills in our lives that we have learned through some combination of schooling and experience, very little time has been devoted to training us as listeners. The irony is that listening is the most frequently used and invaluable skill we could possibly have for our personal and professional lives. Let’s put it in perspective with some of the emphasized aspects of communication. Most of us probably received a minimum of twelve years of instruction on how to write well, yet it is a skill that is only used in approximately 9% of the average person’s daily communication. Reading often receives between six and eight years of formal instruction, yet it only accounts for 16% of our communication. Speaking receives a paltry one year of attention, perhaps two years if we’re lucky, and it is only 30% of our communication. Listening, however, often receives less than a half-year of formal training, yet it makes up 45% of our daily communication. It would seem that the myth of hearing and listening being equal has deeply permeated our culture. Those statistics aren’t meant to rob the other aspects of our communication of their importance, but rather to highlight a grave oversight in our education that, with a little effort, can be improved and yield tremendous and immediate results for us. There are three levels of listening we have to choose from during any given interaction. Defining each level is the first step in understanding how to improve our habits. This is the level that many of us default to under the misconception that we are listening. It often puts us in the uncomfortable position of misunderstanding a message, jumping to conclusions, or simply not being able to recall the message within moments of it being said. Sometimes we are vaguely aware that we are to blame, yet other times we try to pass the blame on to the speaker, claiming that he or she was not interesting or engaging. The most alarming thing about this level of listening is that we are emotionally and mentally detached from the speaker. We may be able to get away with this most of the time, but when the speaker is a loved one, our poor listening is communicating–whether we intend it to or not–that we place minimal value on that person. During those times when we are aware to some degree that we are listening poorly, or we are in a situation where we know that concentration on the message is important, we may be able to tune in temporarily, but with so little formal training in listening the task can be difficult, resulting in “spurts” of listening. Another major contributor to this level is our tendency to search for the next opportunity to jump in and speak rather than actually attending to the message of the other person. That, on top of many other obstacles that we will address in the second part of this series, can cause listening in spurts. This is the ideal. We are able to set aside internal and external distractions so as to listen without judgment or interruption. We are emotionally and mentally invested and provide verbal and nonverbal feedback to the speaker. Empathetic communication is like a partnership, and both individuals must play their role. There is much focus in our culture on the speaker’s role and how to fulfill that role in an interesting, engaging, effective, and efficient way; however, I would argue that when we are in the role of the listener, we should consider it our job to invest 51% of the effort in the interaction. In other words, the listener should be the one doing the heavy lifting. Mutual Respect. I teach argumentation in my AP English Language and Composition class, and one of the concepts I cover is the Rogerian Method. This style of argumentation puts a premium on first listening to your opponent’s views, then confirming that you have accurately understood what has been said prior to expressing your own views. Theoretically, it is an unspoken appeal to “The Golden Rule”: do unto others as you would have them do unto you. More often than not, when you respect others enough to listen to them and actively demonstrate that you have done so, they will be willing to extend the same respect and courtesy to you in return. This applies both at work and in your personal life. Conflict Resolution. In most cases, frustrated people just want to know that somebody listened to their issue, whatever it may be. Even the most volatile people will be diffused to some degree if they believe you actually internalized what they had to say. And if they want more than just to air out their grievances, by listening to them you are putting yourself in a position to handle the situation to the best of your ability. Learning. Listening as you move throughout your daily life is one of the most effective ways to continue learning. It allows you to pick up on details and opportunities you might otherwise have missed, not to mention setting you up to ask better questions when appropriate. And the ability to ask good questions is valuable–as I have told my students, sometimes asking the question is more important than knowing the answer. We’ll be exploring asking good questions in the third part of this series. Career Success. 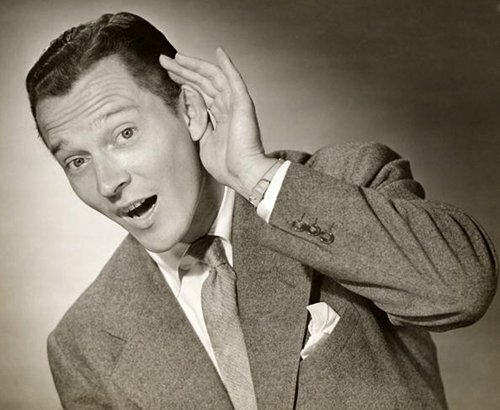 The most frequent complaint made by Fortune 500 companies is that many employees have poor listening skills. These corporate heavyweights have learned that good listeners are more open to new ideas, more innovative, and provide better customer service. Good listening has also been shown to reduce stress and allow for better management of difficult people. What more could a thriving business want from an employee? This is especially true when a promotion is in consideration. As we saw earlier, most careers require 45% of our time to be spent in listening; this jumps to 55% as we move to positions of higher authority further up the career ladder. And for the final connection between listening and career success: when the 15 richest Americans were asked what advice they would give to an average American aspiring to wealth, one of the responses was to become a good listener. The Ladies Love It. What more can I say about this one? Chicks dig a man who knows how to listen. But remember, listening does not mean that you need to rush in and “fix” whatever she might be telling you. She wants you to connect with her–not give her a to-do list or rush out of the room to save the day. That seems like more than enough for us to chew on for today. In the next part of this series, we’ll look at some practical ways to begin sharpening our listening.